Experts on climate change from China and India launched the "China-India Low Carbon Study 2014" on Monday in Beijing, a milestone collaborative research effort between the two countries. The study examines factors in low carbon development such as financing, low carbon technologies and field implementation. 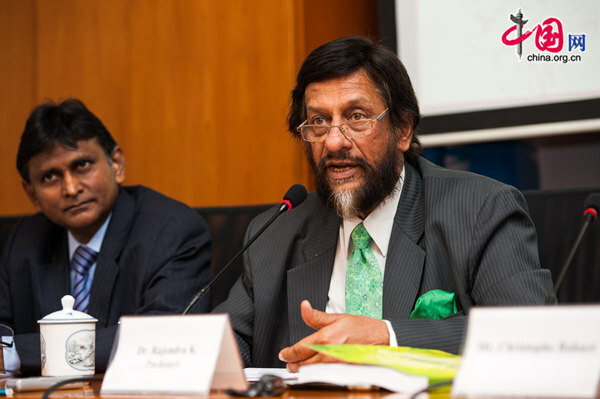 "While economic capabilities and institutional systems vary between the China and India, coordinated knowledge driven processes between the two countries will be instrumental in moving both towards global sustainability goals," said Dr. Panchauri, chairman of the Inter-governmental Panel on Climate Change (IPCC), at the project launch ceremony at the United Nations Development Programme (UNDP) office in Beijing. India lags behind China in terms of socio-economic indicators such as the proportion of the population with access to clean water, improved sanitation and modern fuels. There are regional and urban-rural disparities in both China and India, and the two countries can learn from each others' growth models, said Dr. Panchauri, who noted that there are opportunities for technological cooperation between China and India in clean coal incineration and power generation technologies, energy-saving technologies in the industrial, construction and transport sectors, renewable power utilization and carbon capture.